3/4 in. 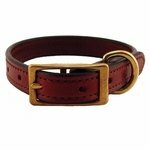 K-9 Komfort Deluxe Leather Standard Puppy / Small Breed Dog Collar. $16.95. "I just received my collar two days ago and I couldn't be more pleased." I just received my collar two days ago and I couldn't be more pleased. It shipped the same day I ordered it and I received it two days later. 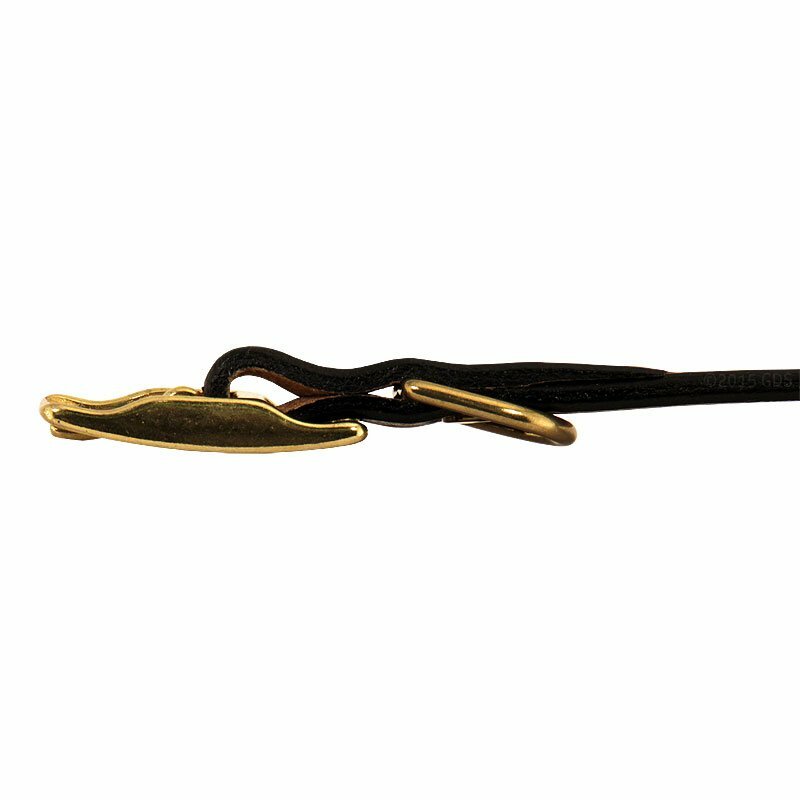 The collar it self is very pretty and made of quality materials. I was worried about the size as my dog is only 19lbs but it fits great and looks wonderful on her. I will definitely be ordering from Gun Dog Supply again. Superb quality and workmanship. Superfast delivery by this outstanding seller. This collar makes a statement!! "He looks tough with it." I didn't think this would fit my Chiweenie dog, but it did, and he loves it! He looks tough with it. Thanks guys. We bought the first dog collar over 3 years ago. It is still holding up very well with two addresses, one in New York and one in Jersey. We needed a second color with the new address. The first caller has held up really well with our dog swimming in salt water all summer long, and it still looks great! I love it. My puppy seems to love it also! The quality and craftsmanship far exceeded the price I paid for this collar. Excellent quality leather and hardware. It will last a long long time!! They sell this product way to cheap!! More than satisfied!! 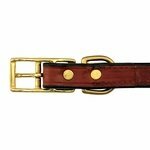 Great collar, quality and craftsmanship. Price was very reasonable too. 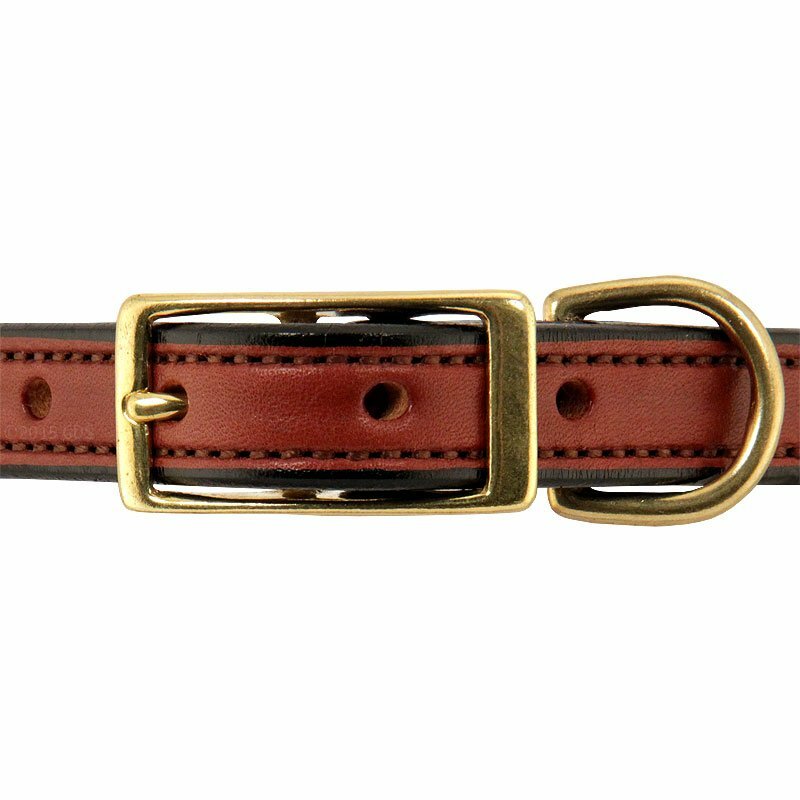 Gorgeous leather collar and the brass tag looks great! I'm most surprised by how quickly it arrived, even in the week right before Christmas. Thanks! Great service. Speedy delivery. And the leather is as durable as it gets. Great Company! Great Collar! Bernese Mt/GSD Mix. Family pet. Nice collar, very well made. Sizing chart was helpful in choosing a larger size for growing pup. Probably should have got the 1 inch though, he's already 45 lbs at 4 months old today. Will definitely be back for another one, once he stops growing. (if that ever happens) Fast shipping and email confirmation and tracking is appreciated. Thanks Steve. Love these collars!!! 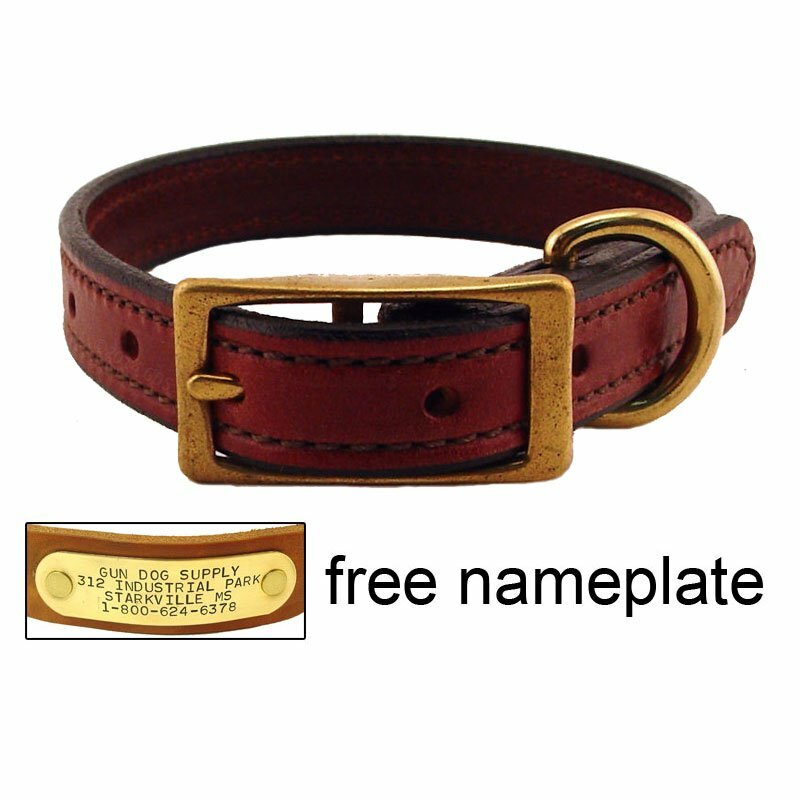 Beautiful thick high quality leather, gorgeous engraved name plate, and super fast shipping! My sneaky beagles are now protected whenever they decide to follow their noses and make a run for it! This collar is great. It is wonderful quality and looks so nice. I love the built in name tag because now when our dog gets up in the middle of the night and shakes we can't hear it. Would definitely recommend it to others!! 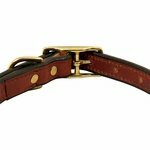 High quality collar and great service! Something wrong with this site. Keeps changing the number of dogs I have - I only have three! I bought collars for my pups 10 and 8 years ago. I loved them and bought the same ones again (phone number change). Best collars out there. Thanks Gun Dog!! Hungarian Circus Dog. Family pet. We are very happy with the collar. It is high quality for a very reasonable price! 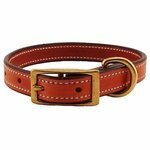 A great collar that is priced great for my 30-pound beagle definitely would buy again. This is a great collar! Well made and the name plate is very nice. I had done a lot of online comparing for name plated leather dog collars and I\'m happy I ended up with collars from Gun Dog Supply!! "Collar was great quality, and the ID tags were perfect." Collar was great quality, and the ID tags were perfect. I have gotten a lot of compliments on them. "Great service and a great product." Decker giant rat terrier. Hunts. Family pet. Great service and a great product. Now I have to order a larger size for Ranger. Great looking collar. Very durable. "Fits my dog really well." Fits my dog really well. Has a great finish to it as well. Super pleased! Min. Pinscher/Boston Terrier. Family pet. "I love all your collars." I love all your collars. 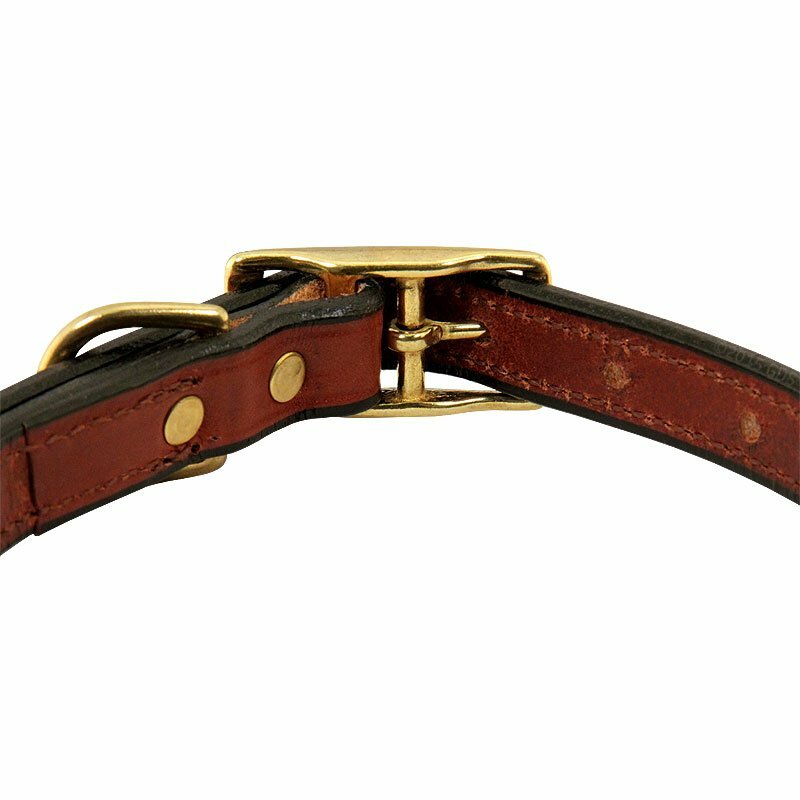 Just ordered my 5th collar from you, and they are the bomb!!! I love the name plates, and they always look so sharp!!! My 2 big dogs are constantly swimming and wrestling with each other, and they have held up so well!!!! I have told many many people about your website!!! "The quality is very good." The quality is very good. The collar was exactly as described. I would absolutely recommend this to anyone. 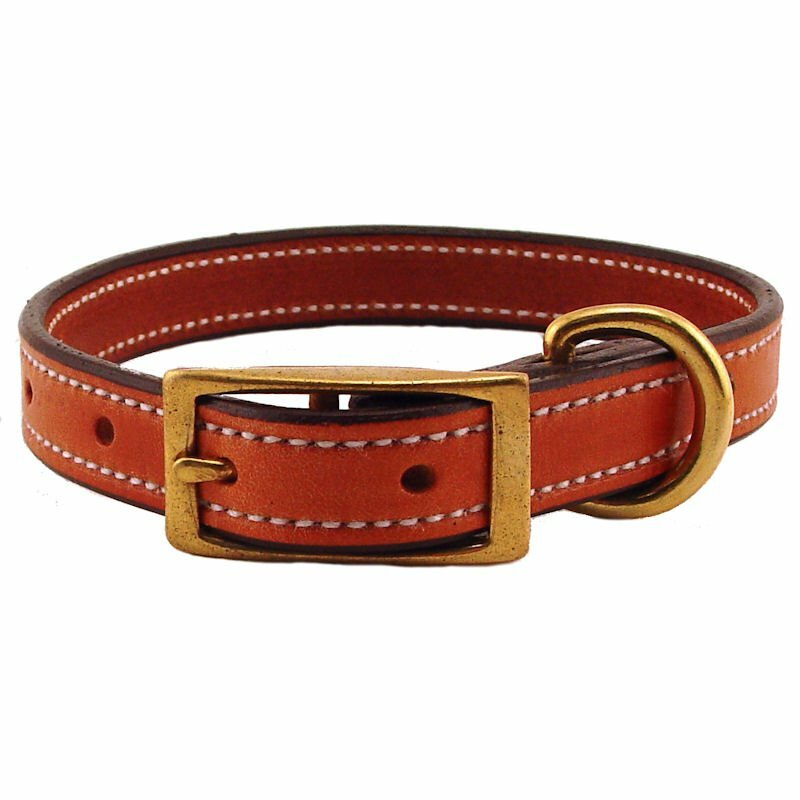 It was very hard to find a leather collar of this quality in a small size. It's perfect! 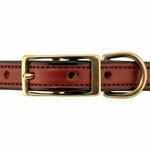 "Really nice collar at a far better price than I found anywhere else"
Really nice collar at a far better price than I found anywhere else for anything comparable, especially with the personalized tag. We'll be shopping with you again in the future! "A very good quality product." Good workmanship. A very good quality product. A sturdy, well crafted, no-nonsense collar. I bought one previously that survived baths, swims, rolling in the mud, pulling on the leash, and so forth. The only reason I bought a new one was that my cell number changed, and I wanted to put her registration ID on the brass tag. Excellent value for the money. I would recommend Gun Dog Supply to all dog owners! Nice collar. It will fit my dog for the rest of his life. Probably will last for the rest of his life. It's great! The leather is very strong for bigger dogs. I love this collar!!! My dog's tags get caught in things, and I love that her ID tag doesn't hang down anymore!!! I would definitely recommend one to all dog owners! "Beautiful collar. 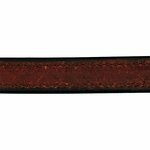 My wife and I love the rich brown leather." Beautiful collar. My wife and I love the rich brown leather. The brass name tag is nice, but if I had it to do over again I would order the collar without the name tag. Not because it's not excellent quality, but because my dog's neck is too small and the brass tag does not allow the collar to lay smoothly around her neck. If my dog was larger it wouldn't be a problem. But when it's small the tag keep it from bending around the neck. That said, we love the collar! "The collar arrived as promised and fits perfectly." The collar arrived as promised and fits perfectly. The workmanship is of the highest quality and we expect it to last for many, many years. Great service from Gun Dog Supply too. 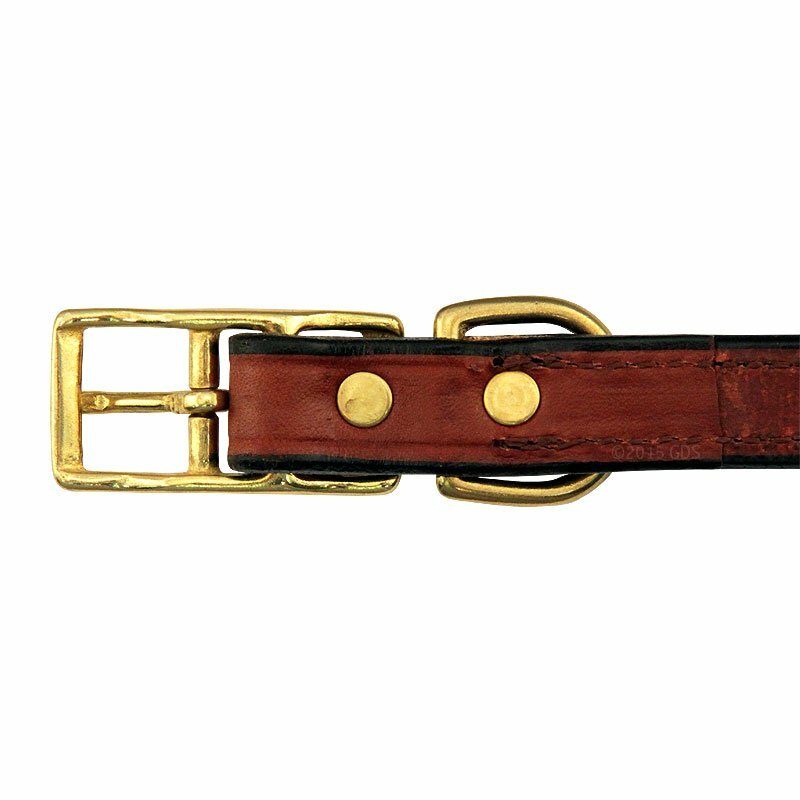 You won't find a collar of half the quality for less than twice the money at retail. Excellent value. Name tag should have been placed about 2 inches farther from the buckle. 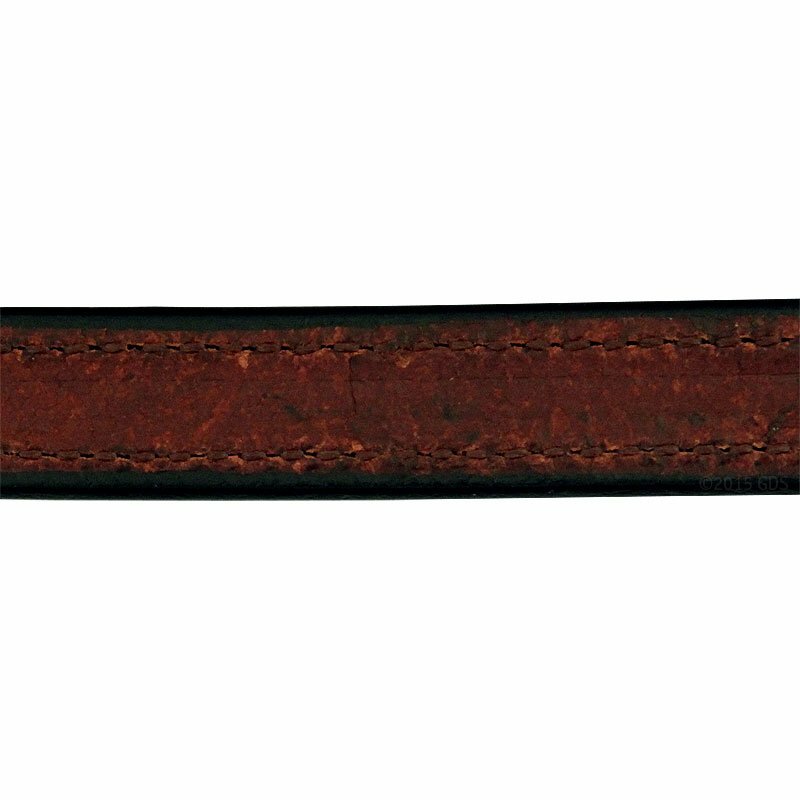 This would place the name tag on the top (back) of the dog's neck instead of the side. The sides of the collar wore incredibly fast (less than two weeks) making it difficult to put the collar on and off. I would not purchase again. Gun Dog Supply refunded my money, so I will still purchase from GDS as the customer service was supportive.